Earlier today, we reported that Guardians Of The Galaxy’s Dave Bautista had said it’s “pretty nauseating” to continue working for Disney after it caved to a “smear campaign by fascists” when it fired director James Gunn (who had been called out by right-wing trolls for making tasteless jokes on Twitter years ago). At that time, Bautista had said he’ll still do what he’s “legally obligated to do,” though, meaning he won’t walk away form his Guardians Of The Galaxy Vol. 3 commitment to protest Gunn being fired, but now it looks like he’s a little more open to that option. 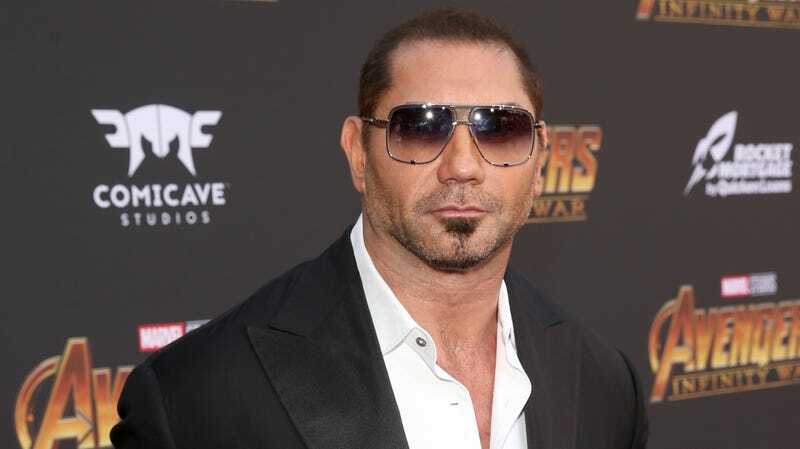 Speaking with ShortList, Bautista now says that he’ll ask to be let out of his contract or recast if Disney doesn’t use the script that Gunn has already turned in for Guardians Vol. 3. “I’d be doing James a disservice if I didn’t,” he says. Bautista also elaborated a bit on his previous comment, saying, “Nobody’s defending [Gunn’s] tweets, but this was a smear campaign against a good man.” He says he spoke to Chris Pratt right after Gunn was fired, and Pratt—who is “a bit religious”—had said he need some time to “pray and figure it out” before he knew how to feel about it.